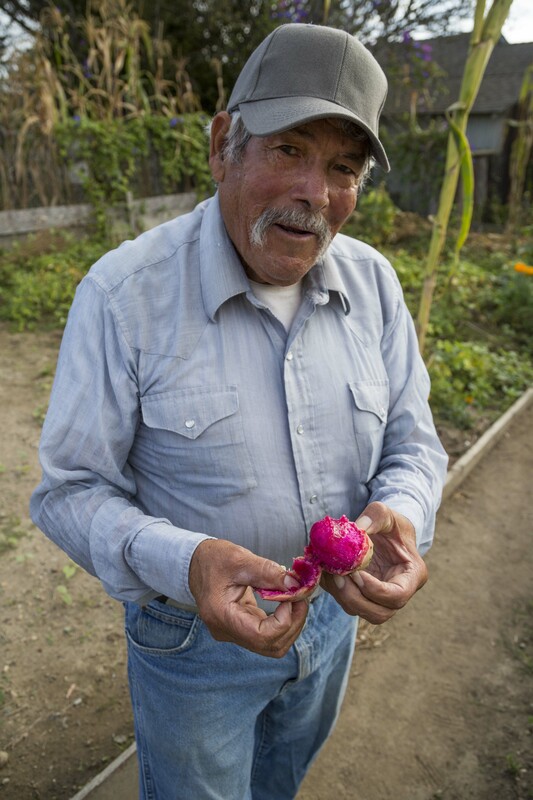 Don Emilio Martinez Castañeda (above) and around 20 other farmers have dedicated years of work to the garden and take pride in providing for their community. *A Spanish translation of this article will be posted soon. It’s 7:45 a.m., and Don Emilio’s sweat has already begun to bead on his brow. He wields a pink household broom, sweeping dirt into rows where young bean shoots are beginning to sprout. He continues to sow seeds, knowing that he might not get to see them blossom before his 21 years of hard work will be taken away. 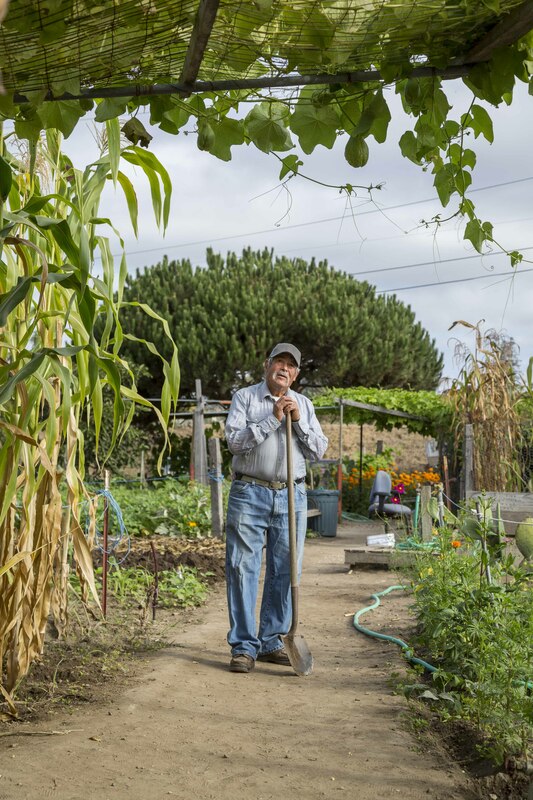 Since 1994, Don Emilio Martinez Castañeda has woken up at dawn to harvest and tend to a garden in the Beach Flats community. After traveling to California from a small ranch in Durango, Mexico when he was 20, he worked downtown at Tampico Kitchen for over 40 years until the garden became his life. It’s his own way of celebrating and giving back to the community that his children and grandchildren grew up in. Now 73, Don Emilio and at least 20 other longtime gardeners learned their garden will close on Nov. 13. Santa Cruz Seaside Company, which has owned and rented the property to the city since the garden opened, will reclaim it for landscaping purposes. The gardeners, the majority of whom are immigrants from El Salvador and Mexico, will be forced to leave the garden and relocate elsewhere to begin from scratch yet again. Santa Cruz Seaside Company proposed that in return for the current plot, they will lend the Beach Flats community gardeners two much smaller plots to continue their gardening on. Yet, as the community is forced to retreat farther away from the Beach Boardwalk, they look to the city to provide support for the Beach Flats. All too often, they feel blind-sided and ultimately neglected — and the proposed temporary solutions aren’t helping. Hubicado atras de casas en los Beach Flats, y cubriendo casi la mitad de un acre, el jardin funciona como una funte de comida organica y centro de la comunidad. Emilio Martinez Castañeda ha trabajado en el jardin por mas de 20 anos. El mais que los agricultores crecen en el jardin es el mismo que se encuentra en sus paises nativos de Mexico y El Salvador. Don Emilio Martinez Castañeda se para a la 6 a.m. o mas temprano cada dia para cuidar las parcelas. Alcalde Don Lane y los otros miembros de City Council se encuentran con aproximadamente 100 miembros de la comunidad en una junta para hablar de las preocupaciones de la perdida de la mayoria del jardin de Beach Flats. 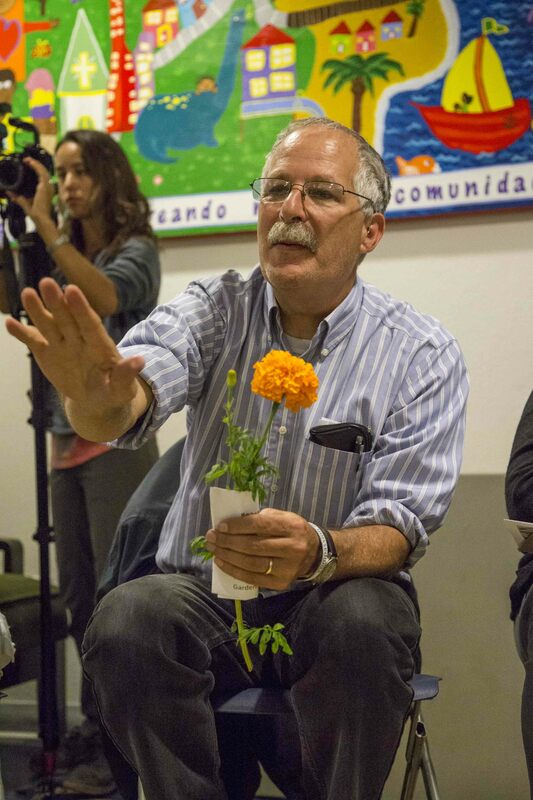 José Lucas Escobar (derecha) habla apacionadamente de la historia e importancia del jardin en Beach Flats, mientras los otros jardineros, miembros de la comunidad y city council escuchan. Alcalde Don Lane aborda las quejas y preocupaciones de los miembros de l comunidad. The Beach Flats community lies framed between the San Lorenzo River and the Santa Cruz Beach Boardwalk. Encompassing only a few blocks, this small fragment of the city is historically associated with low-income residents and high crime rates. In the heart of this community is a garden. Slightly less than half an acre, the garden has served both as a source of food for the community and fostered education through hands-on gardening and farming experience for children. Just last week, over 150 seventh-graders from Branciforte Middle School flocked visited the community garden to experience lessons related to class readings. Santa Cruz Seaside Company spokesperson Kris Reyes said the company plans to use the garden space for agricultural and landscaping needs of the Boardwalk and surrounding areas. The proposed new plots for the gardens are less ideal for the needs of the company. Beach Flats residents made it clear that they don’t want to move to another space, and won’t give up their garden. Gia Grant, co-founder of the community garden, said while it was generous for Seaside Company to allow the garden in its space, “there were burning cars and drug dealing and prostituting out of this space in the neighborhood” before. The garden became a way for Beach Flats residents to turn their community around. But as the community reaches into the city for support, many residents reflect on past times the city has let them down. The garden was nearly closed in 2009 due to budget cuts, and just last year the City of Santa Cruz authorized whitewashing a Beach Flats community mural without informing Beach Flats residents or Victor Cervantes, the local muralist. After extensive meetings and legal action, the city issued a public apology for painting over the mural and wrote a $30,000 check to Cervantes in August. Mayor Don Lane admitted during a community meeting that these events have shown the city isn’t paying enough attention to the Beach Flats. Garden co-founder Marciano Cruz testifies about how engrained the garden is in the community, with the fruits of the gardeners’ labor face City Council members. 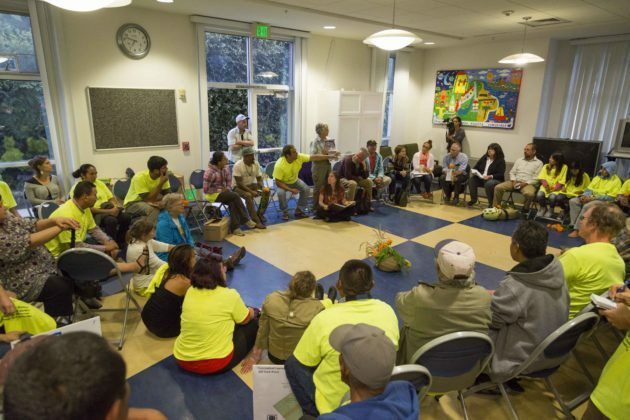 Over 100 community members, Lane, several City Council members and representatives from the Santa Cruz Parks and Recreation Department gathered on Sept. 28 in the Nueva Vista Community Center to discuss the future of the Beach Flats garden and propose a solution. Santa Cruz Seaside Company representatives didn’t attend. 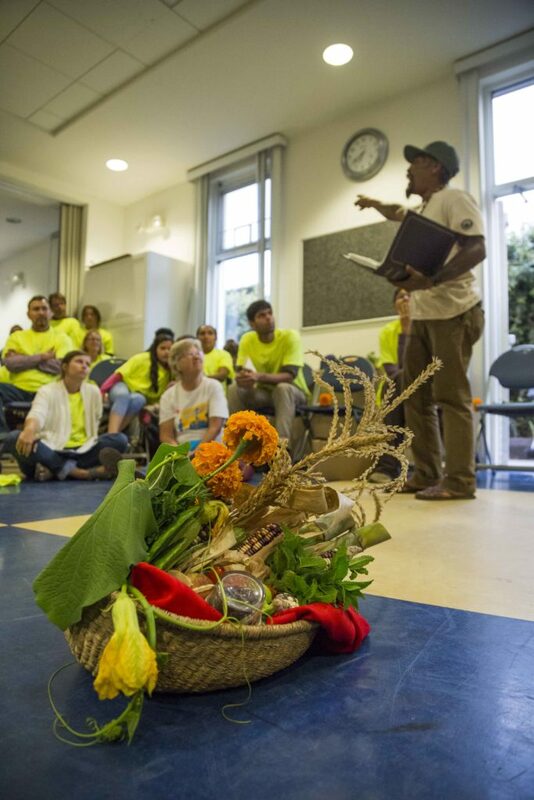 Marigolds and baskets of vibrant, freshly harvested vegetables from the garden were offered the City Council members and representatives, in hopes that they would help the Beach Flats protect its garden. 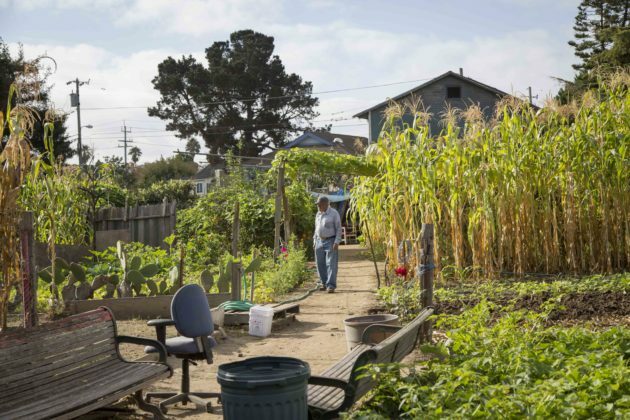 Residents were soon disappointed, when only a few minutes later the City Council proposed Seaside Company’s solution — two much smaller interim gardens to replace the community garden. Santa Cruz Seaside Company owns the Boardwalk, Cocoanut Grove, Boardwalk Bowl, Sea and Sand Inn and numerous other restaurants and residential areas both throughout the Boardwalk area and nationally. 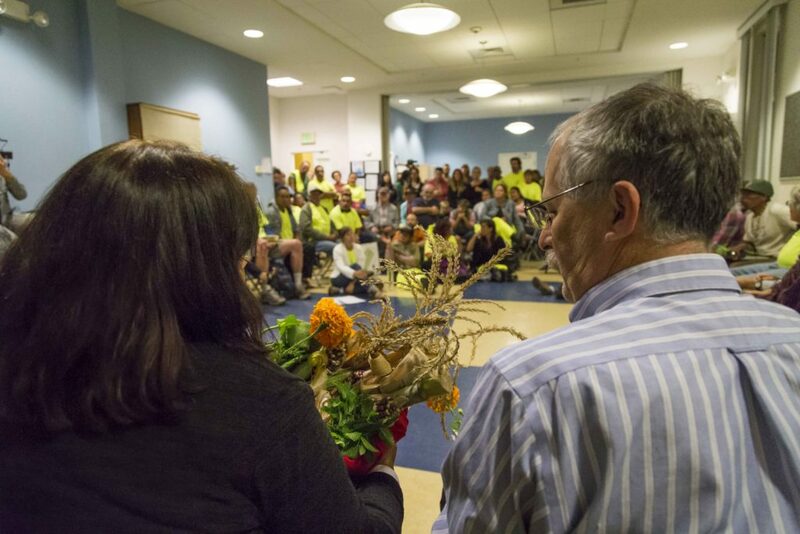 Mayor Don Lane (right) and Santa Cruz director of Parks and Recreation Dannettee Shoemaker (left) receive a basket of corn, beans, sugar cane, flowers and other organically grown goods from the farm while community members and supporters watch. 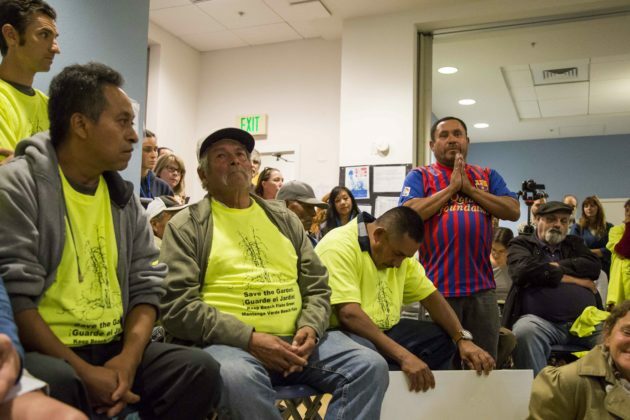 Since Seaside Company announced its plans to take over the garden, Beach Flats community members have pushed for the Santa Cruz City Council to exercise eminent domain, or seize the property from the Seaside Company for public use, and pay the fair market value. Council members said enacting eminent domain would take months, if not years. If the city decides to use eminent domain, the relationship between the Seaside Company and the city will likely be spoiled, Lane said. He said the chance to get a smaller, temporary space would also be lost. As the meeting continued, tensions were high between council members and the neighborhood residents. The city-appointed translator’s translations were called into question by audience members, insisting that vital information was left out. The translator apologized, explaining he was only shortening for time’s sake. 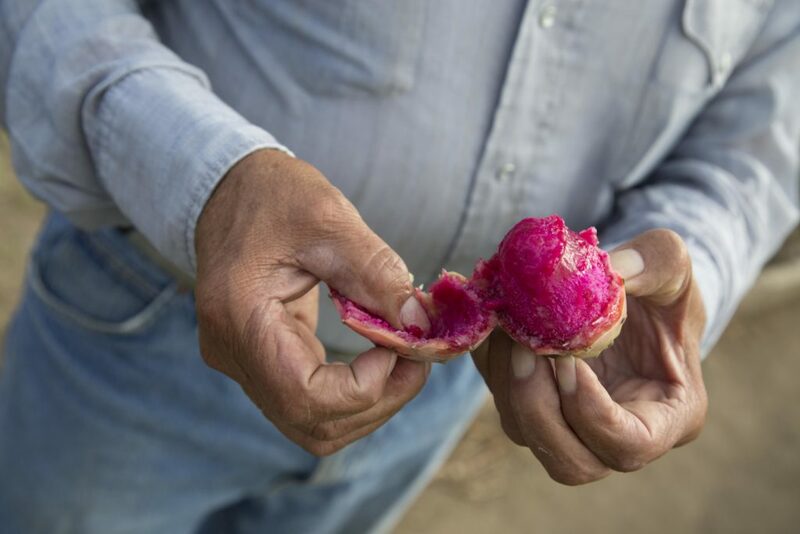 A “tuna” fruit, picked from a “nopal,” cactus, in the garden is peeled. 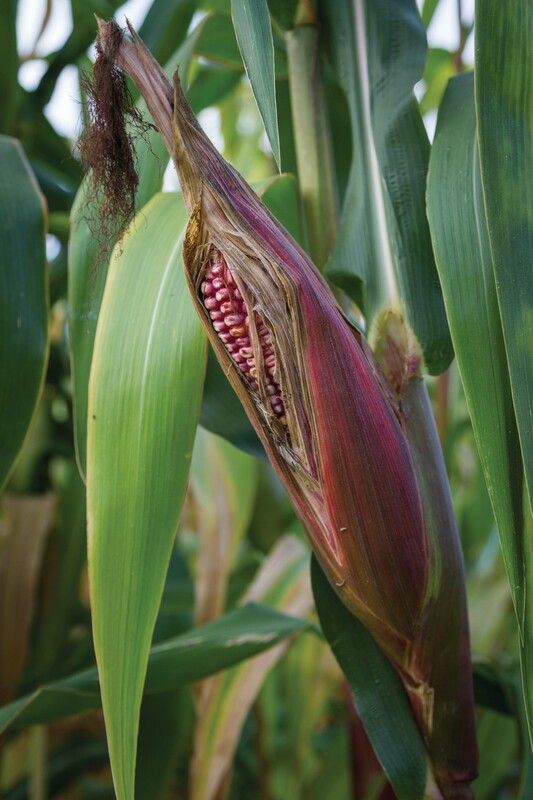 It’s one of a diverse array of fruits and vegetables grown in the garden. City Council members, several gardeners and Seaside Company representatives will meet on Oct. 12 to discuss the future of the garden. Various city representatives said the issue will also be brought up at the Oct. 26 City Council meeting. 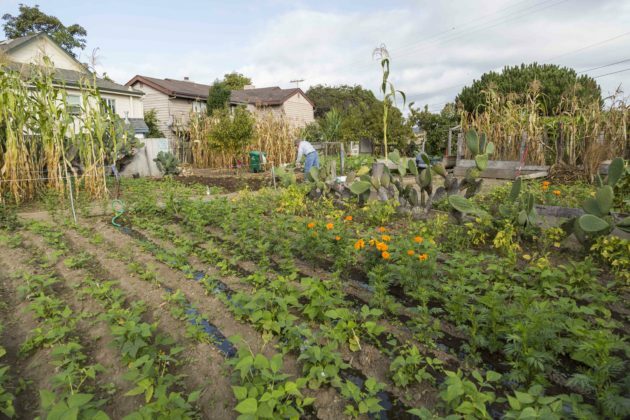 As of Oct. 7, the petition to keep the Beach Flats community garden in place has over 2,000 signatures, both online and in paper. The community will come together to repaint the whitewashed mural on Oct. 10-11.